An email list comprised of valuable subscribers has always been one of the top priorities of online marketers. Any website can effectively generate revenue by targeted use of an email list. You can develop a trusted relationship with your audience and as soon as that trust builds, the chances of increasing the conversion rate of your website become much higher. This is where you can use a WordPress email subscription plugin or tool among the ones that are commonly available in the market. 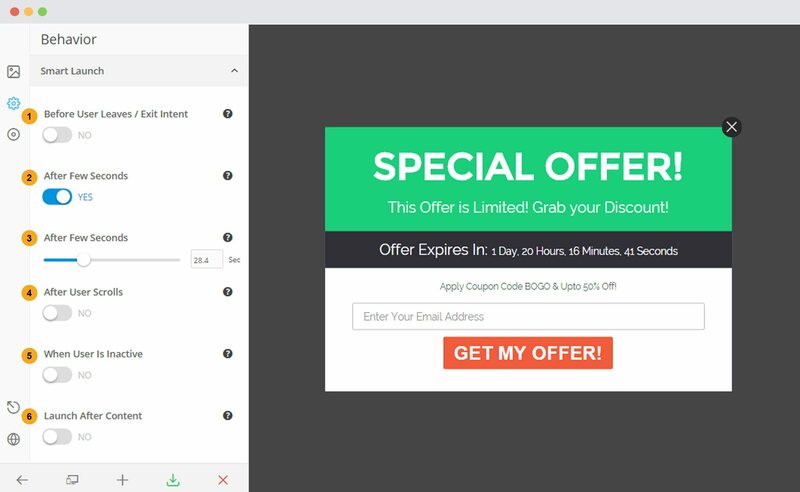 An attractive incentive to subscribe and a nicely designed opt-in form are two extremely important factors that help to develop a targeted email list. But sometimes, even with these two placed strategically, a website may not convert as much as it’s supposed to. It mainly happens because of the lower visibility of the opt-in form on the website. You’ve to make it highly visible, as the more an opt-in form gets viewed, the more number of visitors will subscribe. Undoubtedly, pop-ups are the most successful way to make an opt-in form visible. With the strategically timed appearance, pop-ups get maximum visitor attention and thus help the conversion rate to increase. Display positions: Different offers/messages require different display positions to attract a visitor’s attention. Amongst multiple targeting positions offered by ConvertPlug, you can select one that suits the best for your message. You can decide whether you wish to use a modal popup, a slide-in pop-up, an info bar, or display the module inline within or after a post or in the widget area. Ready-made templates: Different businesses need different templates and styles to promote their brands at the highest possible level. With ConvertPlug, you can create one of your own, in accordance with your product/service, from the built-in library of ready-made professional templates. Real-time live editor: Live editor of ConvertPlug empowers you to make alterations to the readymade templates, thus making the template ideal for your product/service. Interestingly, no coding skills are required to make these changes. Exit-intent technology: With exit intent technology, converting abandoning visitors into subscribers and eventually, customers of your products and/or services is made easy. Engage visitors with enticing and targeted offers when they intend to navigate away from your website. 2-step opt-in technology: Increase conversions and develop superior-quality email list with ConvertPlug’s 2-step opt-in technology. Instead of asking your visitors to subscribe at the first step, allow them to show their interest first and then subscribe. With this feature, an opt-in form appears only after visitors click on a button, image or link. Capture and sync leads: This feature empowers you to develop different segmented email lists depending upon your categories and offers. With ConvertPlug, you can capture, sync, handle and analyze all the contacts without having to move to any other place. A/B test: Conduct numerous A/B tests to determine the message that brings the maximum conversion your way. Apart from their unquestionable importance, the functional range of triggers, in the field of conversion optimization, is quite varied. They can be utilized to greet your visitors automatically, or to engage the customers during their decision-making stage, or preempting the customer’s queries and much more. With some highly beneficial triggers like “Smart Launch”, “Manual/Two Step Launch”, “Cookies/Repetition Control”, “Precise Targeting” and “Personalization”, ConvertPlug empowers you to optimize the conversion rate by every possible means. Read on to know about the incredible features of the aforesaid triggers. According to case studies, on an average, a 200-600% growth in email sign ups can be achieved when exit intent is merged with content marketing efforts. Well timed: A well-timed pop-up is a popup that only appears to your visitors after they stay on your site for a certain period of time. In this case, proper timing is the game changer. Your visitors may be turned off if you show the message too early. But if you display it too late, your visitors may have already abandoned, or they’re so deeply engaged with your content that the pop-up might simply annoy them. 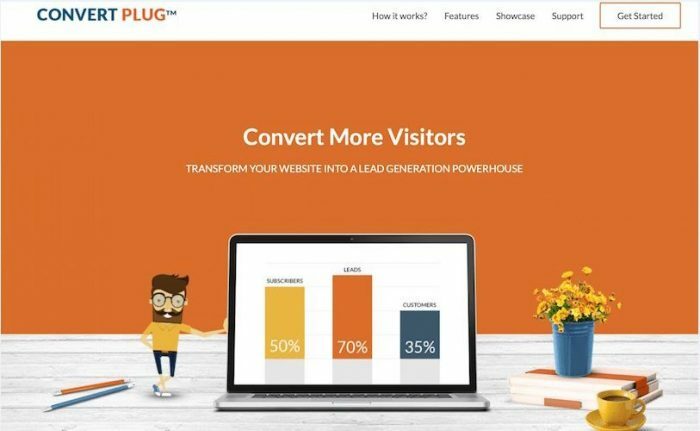 Well, timed pop-ups of ConvertPlug empower you to generate leads from prospective visitors without irritating them or interfering with their browsing experience. Merge them with the online marketing strategies and you may simply be amazed to see the fast growth of your email list. After scroll: ConvertPlug allows you to display certain messages for engaged visitors. You can trigger a specific message when users scroll down to a certain point e.g. when they reach the middle of a page. User inactivity: ConvertPlug triggers an action when it observes user inactivity like no gesture, input tag event or touch. This technology is particularly useful as it enables automatic resets like automatically directing to a specified scene after a specified amount of time is passed without any activity on a particular web page. More importantly, you can stop the inactivity timer either when any interaction event like gesture or touch occurs, or its associated scene becomes hidden. After Content: The Launch after content trigger identifies when a user has reached the end of a post or the content on the page. It works well when you do not want to disturb the user while he is reading or doing something on your website. You can use this trigger to display similar posts, products or pages on the website. Users who found the content worth reading till the end might as well want to know more. CSS class: With ConvertPlug, you can put in an additional custom class to the page elements. In case you wish to launch modules through elements such as buttons, menu bars and more, you can use the CSS Class that will help you do so. The launch with CSS Class feature lets you display a module on the click of any such element on a page. 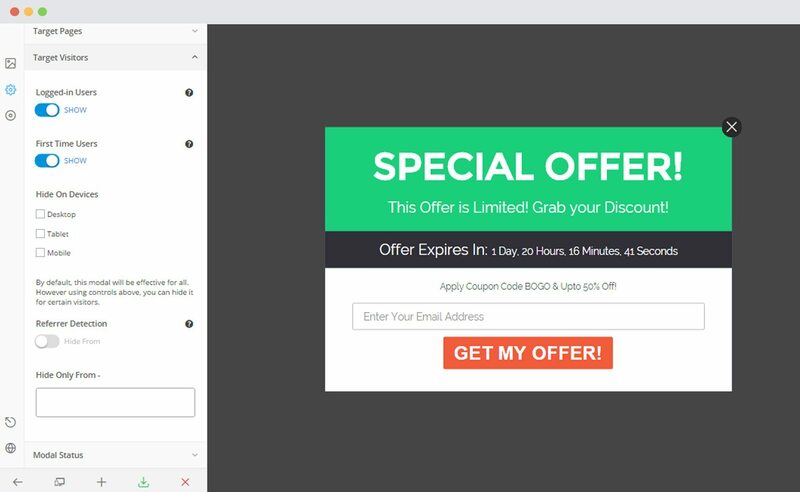 Shortcode: ConvertPlug allows you to manually display a modal pop-up, when visitors click on an image or text, by using the shortcode. Shortcode can be easily found in the “Manual Display” under “Behavior” in the “ConvertPlug Module Editor”. After conversion: Cookies/Repetition control feature of ConvertPlug lets you specify the number of days a modal won’t be displayed after a user has signed up. After closing: You can also specify the period of time a modal won’t be shown after a user closes it. ConvertPlug comes with a powerful feature called “Page level targeting”. It allows you to precisely target pages, categories and posts. You can display different opt-in forms on different pages, with precisely targeted messages, content, taglines and design. Under the “Target Pages” option, you can set the “Enable On Complete Site” button to “Yes” if you want a modal to function across the entire website. In case you want the modal to operate in certain areas, you’ve to set the button to “No” and specify the areas. Logged-in users: This feature of ConvertPlug allows you to control the visibility of a modal to your logged-in users (assuming your website has login facility). First Time users: All the modules you create using ConvertPlug will be shown to all the users unless you have applied any filters. ConvertPlug identifies first-time visitors and allows you to decide whether a specific module should be displayed to them or not. Device Detection: ConvertPlug identifies the device a user is coming from. You can control the visibility of a module by differentiating users on the basis of the device using to browse your website. Referrer Detection: ConvertPlug detects the website your users have come through. You can customize and personalize modules to be shown to users coming from a particular domain/domains or hide from users coming in from a specific domain/domains. With beautifully designed professional templates of ConvertPlug, you can create your own design that suits your product/service the best. The best part is that you won’t need to hire a designer as you can do it on your own, without any particular designing or coding skills. ConvertPlug comes equipped with a huge repertoire of design templates for your every designing requirement related to modal pop-up, slide-ins, info bars, opt-ins, exit intents, social sharing, offers, updates and videos, which you can leverage based on what your exact needs are. This makes it a complete WordPress email subscription plugin one might need on his website. With ConvertPlug, you can easily integrate with third party email marketing software. This feature helps you to store and strategically manage leads acquired through the opt-in forms developed using ConvertPlug. To address the diversified requirements of users, ConvertPlug allows all possible integrations like with “Active Campaign”, “Campaign Monitor”, “Aweber”, “iContact”, “HubSpot”, “MailChimp”, “Mad Mini”, “MyEmma” and much more. ConvertPlug also empowers you to integrate add-ons like “Campaign”, “Constant Contact”, “GetResponse”, “MyMail”, “SendinBlue”, “MailPoet”, “RapidMailer” and many more. With all these excellent features that help you develop a perspective and superior quality email list, ConvertPlug – WordPress email subscription plugin comes at an unbelievable price of $21. Within this price, you’ll become eligible for QC by Envato, lifetime future updates and 6 months’ support that can be extended to 12 months by paying an additional amount of just $6.30. Yet another great plugin review which help to make informed purchase decisions.